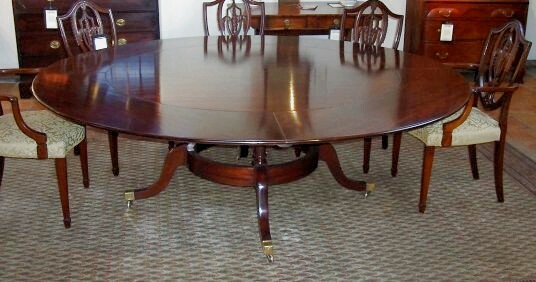 Very fine custom bench made George III style figured mahogany round dining table with four removable perimeter leaves, the fixed top and leaves with bullnose edge, above a circular base with four cannon shaft turned supports, raised on four arched saber legs ending in brass casters. Finished as shown in hand rubbed natural shellac patinated finish. This table pattern was made from an original George III table we owned over fifteen years ago and it has been a favorite custom table of many of our designer clients. Other commercial furniture manufacturers offer a variation on this pattern, but our quality is far superior and the differences in quality are easily recognized upon physical inspection of this superb custom table. As shown, dimensions are 29" high, 60" diameter without leaves, 88" diameter with leaves. This pattern is available in customized sizes larger or smaller, and is also available without leaves as a center table.